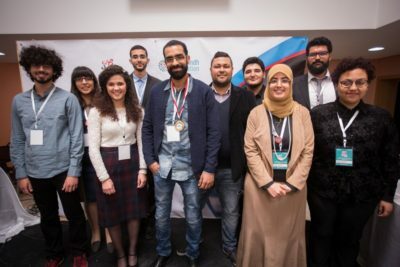 The grand final of the English track of the Tunisian National Debate Championship 2017, which took place for the first time under this name (formerly: Tunisia Boxing days), was won by the team SupCom (Gaith Ben Abdelhamid, Takwa Gnenna). They debated the motion “THR online journalism” as Opening Opposition against the teams ENIB (Marwa Soussi, Yassine Bouguerra) in Opening Government, TBS (Amir Ammar, Maram Chaabane) in Closing Government and ENS 1 (Manel Khedim, Zahra Mouakher) in Closing Opposition. 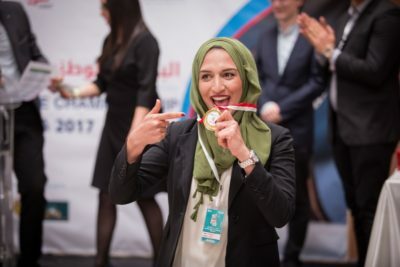 The final was adjudicated by Lennart Lokstein (chair), Imene Dhene, Rima Mansour, Moez Dhahri, Jihed Sahli and Sarra Jouini, which also were the chief adjudicators of the English track. 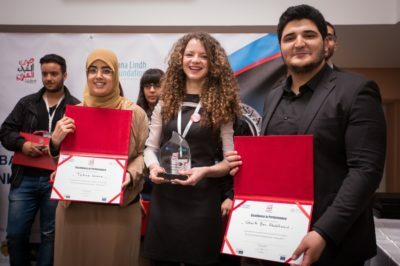 The TNDC was organised as part of the Young Arab Voices programme, which is run by the British Council (the UK’s international organisation for educational opportunities and cultural relations) and in Tunisia cooperates with the Anna Lindh Foundation to further debate culture across the MENA region. It featured 5 rooms for the English track and included 7 preliminary rounds, quarterfinals, semifinals and the final. Apart from round 7 the motions were announced two days ahead of the tournament, the sides of the teams were announced 15 minutes before the round started. For round 7, motion and positions were announced one hour before the debate started. Top English speaker of the preliminary rounds was Firas Mansouri from the team Mannouba 1. The tournament had an Arabic track of 5 rooms as well, which was won by the team Ibn Sharaf 1 (Amen Rezgui, Ghaya Ben Mbanek). Top preliminary speaker of the Arabic track was Abir Mejrouh from the team Forum des Jeunes Juristes. R1: TH, as a consumer, would shop from local commerces rather than from big malls. R2: THBT it would be in the interest of the current Tunisian government to make prisoners arrested for marihuana consumption the following offer: You are free again, but have to report for consumption testing twice a week. If the level of THC found at your tests constantly goes down, you stay free, else you go back to prison. After six months without consumption you are pardoned. R3: THW end professionalism in Tunisian sports, e.g. paying players as a job. R4: TH, as a consumer, would shop from local commerces rather than from big malls. R5: THBT it would be in the interest of the current Tunisian government to make prisoners arrested for marihuana consumption the following offer: You are free again, but have to report for consumption testing twice a week. If the level of THC found at your tests constantly goes down, you stay free, else you go back to prison. After six months without consumption you are pardoned. R6: THW end professionalism in Tunisian sports, e.g. pay-ing players as a job. R7: TH, as the owner-and-manager of a restaurant, in a country where tips are given, would collect all tips gained during a shift and have them equally distributed amongst those shift’s workers. QF: THW privatize all public banks in Tunisia. SF: THBT refugees accepted for asylum should be granted equal citizenship rights for the duration of their stay.